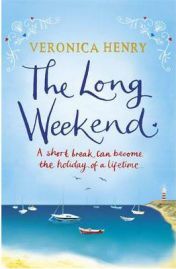 Veronica Henry has written at least half a dozen books but The Long Weekend is the first novel I have read of hers. I’m really pleased that I did as it was a thoroughly enjoyable and relaxing read and has made me want to read more books from this entertaining author. The Townhouse by the Sea is the perfect place to spend a long weekend getting away from it all. It’s in an idyllic setting and the owners’ attention to detail is second to none! The hotel is full and each guest is there for their own reasons but everyone is hoping for a fabulous weekend. Unfortunately, things don’t always turn out exactly as expected. Claire Marlowe owns and runs the hotel with her partner Luca. She’s really looking forward to the busiest weekend of the year; that is until a face from her past turns up and sends her emotions into turmoil. Colin is spending some time with his daughter Chelsey and her mum – it would be fine were it not for the fact that his wife thinks that he is away at a business convention. Laura is looking for the dad who she has never known. The problem is that there’s a strong possibility he doesn’t want to be found. Then there’s Trevor and Monique trying their best to overcome a family tragedy and Nick who should be enjoying his last weekend of freedom before walking down the aisle with the love of his life, Sophie. At least that’s what he’s been telling himself and he has virtually succeeded in convincing himself that she is his great love – until he comes across Claire again, the girl he loved fifteen years ago until she did something that broke his heart. These are all fascinating characters with their own stories to tell. Each of these was enough to warrant my enjoyment, but the way all the stories merged together made it quite special. Having the hotel as a backdrop works really well as it does not feel at all strange to have this mix of people all together in the same place. The Long Weekend is an absorbing read from start to finish and my interest did not wane for one second. Veronica Henry is an excellent storyteller and I’m looking forward to reading many more of her books now that I have read and enjoyed this one so much. With thanks to Orion for providing a review copy. No Comments on "The Long Weekend"